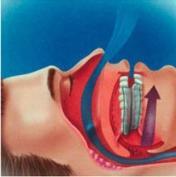 There are many treatment options available to people suffering from snoring and Obstructive Sleep Apnea (OSA). Being overwieght, smoking, drinking alcohol or using sleeping pills or muscle relaxants may be contributing to your snoring and sleep apnea. Good sleep hygiene, weight loss, avoiding alcohol, quitting smoking and exercise are some helpful OSA treatments a patient can practice on their own. Besides these, there are three primary methods that dentist and physicians use to treat snoring and sleep apnea. These methods are Continuous Positive Airway Pressure (CPAP), Oral Appliance Therapy (OAT), and Surgery. The most common method is CPAP. CPAP involves wearing a face mask that supplies a steady stream of air through the nose and mouth during sleep. 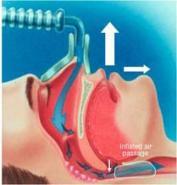 This airflow goes down the airway and acts as a splint holding the airway open and preventing collapse. The method that has been getting the most attention recently is Oral Appliance Therapy. Oral Appliances (OA) are small plastic devices that are worn in the mouth similar to orthodontic retainers or sports mouth guards. They work by holding your lower jaw open and slightly forward during sleep. This prevents the tongue from falling back into the airway and contacting the back of the throat causing an obstruction. The airway remains open promoting adequate air intake. The third method is surgery to the soft palate uvula and tongue to eliminate the tissue that collapses during sleep. More complex surgery can reposition the anatomic structures of the mouth, jaws and facial bones. Determination of proper therapy should be made by a joint consultation of your dentist and physician. As part of your medical team, they will work together in your diagnosis, treatment and on-going care. According to the American Academy of Sleep Medicine, oral appliances are the recommended first line of treatment for mild to moderate sleep apnea. CPAP is recommended as the preferred treatment for severe apnea. Oral appliances present an appealing treatment option for newly diagnosed patients as well as patients who have been previously diagnosed with sleep apnea and are unhappy with the recommended CPAP therapy. In general, surgery is indicated when the other therapies are non-applicable, unsuccessful, or intolerable. Surgery is “site-specific” meaning it requires the identification of specific anatomic areas contributing to the airway obstruction. This will vary from person to person. A detailed examination of the entire upper airway is necessary before deciding which surgical procedures may be most effective.